Scholarship applications are due by April 16th! Come see our democracy in action! Get 1%* Cash Back! 60 Days No Payments! For Auto, Boat & RV loans, or other Unsecured Debt from Elsewhere. *Special Promotional Terms: Refinance a qualifying loan (Auto, Truck, SUV, Van, RV-motor home, trailer, boat, motorcycle, watercraft; or, Closed-end, Unsecured loan), currently financed elsewhere, and qualify to receive: 1. An immediate Cash Rebate equal to 1% of the approved loan value [Note: the full amount of the promotional cash rebate remitted to member may be forfeit if less than 50% of the total funded loan balance remains in the account 120 days after the loan funding date]; and, 2. 60-Days No Payments (interest will continue to accrue during the 60-day period). Wauna CU will also pay the vehicle title transfer fee up to $100 (member is responsible to pay any additional amount). Minimum loan amount to qualify for special terms: $2,000; Maximum rebate allowed is $500 per loan. These special financing terms end at close of business April 30, 2018. Rates & financing are offered based on applicant’s credit worthiness and term of the loan. Membership with Wauna CU required to qualify for this special offer. Use “WaunaCar” to find your next auto! Finance with us for cash back & special term! The following information pertaining to debit cards is added to the Electronic Fund Transfers Agreement and Disclosure that was previously provided to you:Card Information Updates and Authorizations. If you have authorized a merchant to bill charges to your card on a recurring basis, it is your responsibility to notify the merchant in the event your card is replaced, your card information (such as card number and expiration date) changes, or the account associated with your card is closed. However, if your card is replaced or card information changes, you authorize us, without obligation on our part, to provide the updated card information to the merchant in order to permit the merchant to bill recurring charges to the card. You authorize us to apply such recurring charges to the card until you notify us that you have revoked authorization for the charges to your card. Your card is automatically enrolled in an information updating service. Through this service, your updated card information (such as card number and expiration date) may be shared with participating merchants to facilitate continued recurring charges. Updates are not guaranteed before your next payment to a merchant is due. You are responsible for making direct payment until recurring charges resume. To revoke your authorization allowing us to provide updated card information to a merchant, please contact us.Theterms of the Electronic Fund TransfersAgreementand Disclosure (Agreement) are revised as described above.Please keep a copy of this Notice with the Agreement. Except as set forth in this Notice, the Agreement is unaffected and shall continue in full force and effect in accordance with its terms. If there is a conflict between this Notice and the Agreement, the terms of this Notice will prevail. Looking for a Loan to Love? & your title transfer is our treat! That’s why we’re offering to take your less-than-loveable-loan from elsewhere & delight you with a Wauna Credit Union loan! *Special Promotional Terms: Refinance a qualifying loan (Auto, Truck, SUV, Van, RV-motor home, trailer, boat, motorcycle, watercraft; or, Closed-end, Unsecured loan), currently financed elsewhere, to Wauna Credit Union, and qualify to receive: 1. An immediate Cash Rebate equal to 1% of the approved loan value [Note: the full amount of the promotional cash rebate remitted to member may be forfeit if less than 50% of the total funded loan balance remains in the account 120 days after the loan funding date]; 2. 60-Days No Payments (interest will continue to accrue during the 60-day period); and, 3. Wauna CU will also pay the vehicle title transfer fee up to $100 (member is responsible to pay any additional amount). Minimum loan amount to qualify for special terms: $2,000; Maximum rebate allowed is $500 per qualifying loan. These special, promotional financing terms end at close of business April 30, 2018. Rates & financing are offered based on applicant’s credit worthiness and term of the loan. Membership with Wauna CU required to qualify for this special offer. Competitve rates and easy, automatic deposits are just a few of the benefits. Talk to one of our experts & find out how easy retirement planning can be! but will make fora great future! Use TurboTax to file and be entered to win $25K! Plus, get a member discount when you use Turbo Tax through the link at waunafcu.org! while saving for the future & helping your community thrive! This Addendum revises the terms of the Electronic Fund Transfers Agreement and Disclosure (Agreement). Please keep a copy of this Addendum with the Agreement. Except as set forth in this Addendum, the Agreement is unaffected and shall continue in full force and effect in accordance with its terms. If there is a conflict between this Addendum and the Agreement, the terms of this Addendum will prevail. to earn DOUBLE Rewards Points during November and December! Earn TRIPLE Rewards Points November 23-27 and December 24th! *VISA Rewards Credit Cardholders will earn double rewards points for purchases during November and December 2017. They earn triple rewards points for purchases conducted November 23 through November 27 and on December 24, 2017. Rewards Points are not transferable. Complete promotion details available at waunafcu.org. 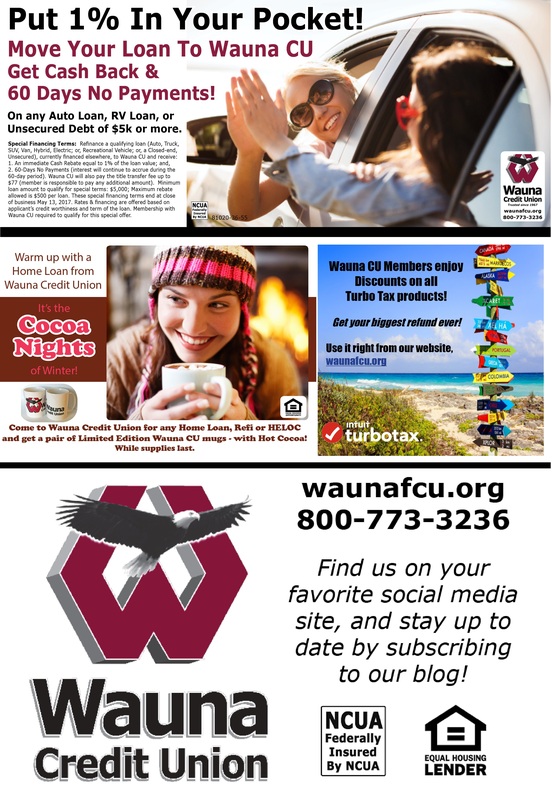 Membership with Wauna Credit Union is required. This special offer end December 31, 2017.
Who Says You Need Snow For a Festive Holiday? Wauna Credit Union. Trusted since 1967. Get your online purchases authenticated automatically! Make your phone your wallet! No more lost cards! A free app for security! Alerts you every time your card is used. 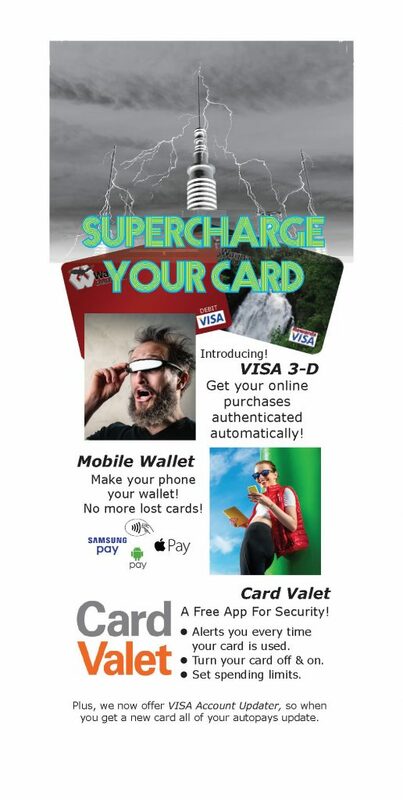 Plus we now offer VISA Account Updater, so when you get a new card all of your autopays update. Counting Down? Your Secret is safe with us! Let Wauna Credit Union help you gather all that school gear without wringing out your wallet! Clothes, supplies, computers, even tuition – We’ve got you covered with a variety of options: Try our Instant Money Loans, Personal Loans, and/or VISA Credit Cards! Wauna Credit Union membership is open to anyone who lives, works, attends or worships in Clatsop, Columbia and western Washington County in OR, or Pacific County in WA. 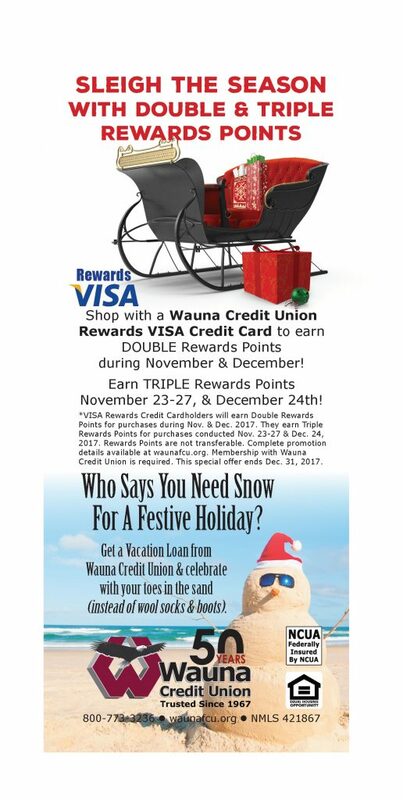 For the perfect vacation, take a Wauna Credit Union VISA Rewards or Platinum Credit Card Along! Low interest & few fees make our credit card a must in you wallet! 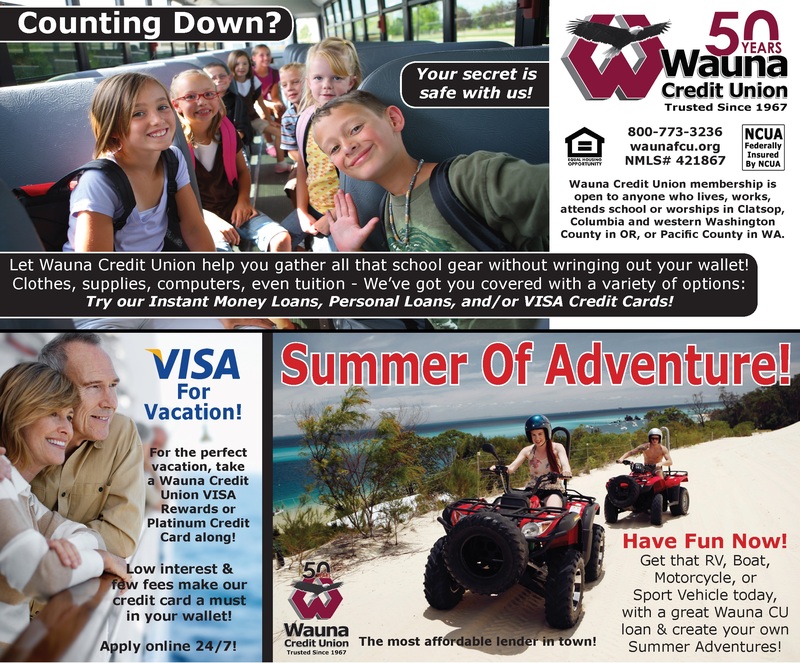 Get that RV, Boat, Motorcycle, or Sport Vehicle today, with a great Wauna CU loan and create your own Summer Adventures! The most affordable lender in town!